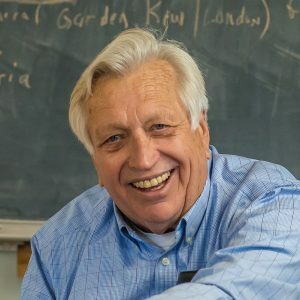 Wes Jackson is one of the foremost figures in the international sustainable agriculture movement. In addition to being a world-renowned plant geneticist, he is a farmer, author, and professor emeritus of biology. He was a professor of biology at Kansas Wesleyan University, and a tenured full professor at California State University, Sacramento. There he established and chaired one of the first Environmental Studies programs in the United States. In 1976 he left academia to co-found The Land Institute, a nonprofit educational organization in Salina, Kansas. There he conceptualized Natural Systems Agriculture—including perennial grains, perennial polycultures, and intercropping, all based on the model of the prairie. Jackson is the author of New Roots for Agriculture (1980), Altars of Unhewn Stone: Science and the Earth (1987), Becoming Native to This Place (1994), and Consulting the Genius of the Place: An Ecological Approach to a New Agriculture (2010). With Wendell Berry he co-edited Meeting the Expectations of the Land: Essays in Sustainable Agriculture and Stewardship (1985). He is a Pew Conservation Scholar, a MacArthur Fellow, and a Right Livelihood Laureate (also known as the Alternative Nobel Prize). Smithsonian Magazine has said that Jackson’s mission is “the overthrow of agriculture as we know it,” and included him in its “35 Who Made a Difference” list in 2005. Life Magazine named him among the 100 “most important Americans of the 20th century.” He is a member of The World Future Council and the Green Lands, Blue Waters Steering Committee. Jackson has a B.A. in biology from Kansas Wesleyan University (1958), an M.A. in botany from University of Kansas (1960), and a Ph.D. in genetics from North Carolina State University (1967). Wes Jackson is a visionary, searching for an agricultural paradigm that mimics Nature’s prairie. Forty years ago he said, “This is going to take 50 to 100 years.” Research at The Land Institute is ahead of schedule: Their scientists have developed the first perennial grain in the history of homo sapiens, the first new grain crop in 4,200 years. Trademarked under the name Kernza®, it is now being grown commercially on a limited scale. Patagonia Provisions’s new beer, Long Root Ale, was the first Kernza® product to enter the retail marketplace. Researchers at The Land Institute are also working to develop perennial wheat, perennial rice, perennial sorghum, and silphium, a wild perennial relative of sunflower, with more to come. Contact Wes Jackson about speaking terms and dates.